The 2015 Paris Climate Agreement aims to shape policies away from an attitude of coping with the impacts of climate change after the fact, to managing climate risks in a more anticipatory manner. Now each member state has had to decide how to achieve these goals in what is referred to as the Nationally Determined Contributions (NDCs). Climate risk insurance, if applied properly, can become one of the key strategies to better prepare countries and their citizens for the risks that climate change presents. 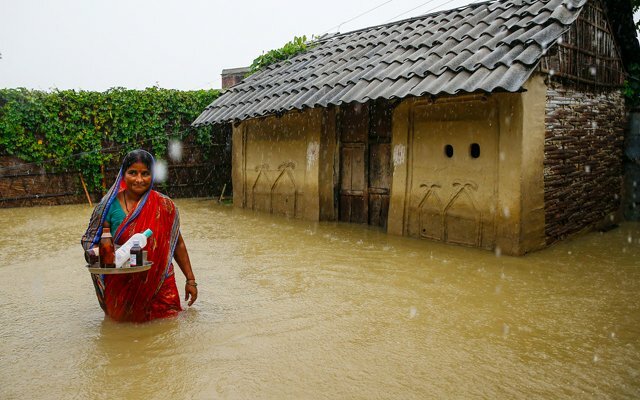 The damages caused by extreme weather often hit vulnerable populations the hardest, and can force them to resort to coping strategies that can impede sustainable development and drive them further into poverty. However, the timely and reliable payouts of climate risk insurance allow them to recover more quickly and be better prepared for future disasters. At COP 23, the Munich Climate Insurance Initiative (MCII) and the German Development Institute (DIE) will launch a joint publication on the added value of climate risk insurance for the implementation of the Nationally Determined Contributions with a focus on resilience. MCII and DIE analyzed the 165 NDCs that have been submitted by member states so far for their potential uptake of climate risk insurance mechanisms. The study found that overall 38 countries mention climate risk insurance approaches in their NDCs, while an additional four mention them in their more elaborated plans. Together these countries represent more than 4 billion people, including almost half of the world’s extreme poor, living on less than $1.90 per day. However, not all the countries that mention climate risk insurance in their NDCs are poor. In fact, they span all levels of development and average income. How and in which sectors these countries are considering climate risk insurance solutions varies, but many are looking at them in relation to the agriculture sector and food security objectives, but also in the context of infrastructures, health or industry. The authors of the study are now calling for more support for the adoption of climate risk insurance solutions because their results clearly indicate political will on the part of the implementing countries to do so. They recommend bilateral and multilateral initiatives to further explore options, as well as an increased focus on establishing enabling conditions at the national level, such as regulatory and supervisory frameworks, capacity development and social safety nets. They also appeal to the United Nations Framework Convention on Climate Change (UNFCCC) to set up support structures for pro-poor climate risk insurance approaches and provide international guidance. The results of the study will not only be presented at a COP side event, but they will also feed into the NDC Explorer, an interactive online tool developed by DIE that provides comprehensive analyses and comparisons of all the submitted, intended and final NDCs. The NDC Explorer will now feature a filter option that allows users to search the database of NDCs specifically for risk insurance provisions in each participating country. The launch of the report will take place on Tuesday, November 7 from 10 am to 12 pm in the DIE Interconnections Zone, which is publicly accessible (more information here). You can read the report here. The NDC Explorer can be accessed here. If you would like to interview Soenke Kreft, the lead author of the study, please contact hoffmann@vie.unu.edu.